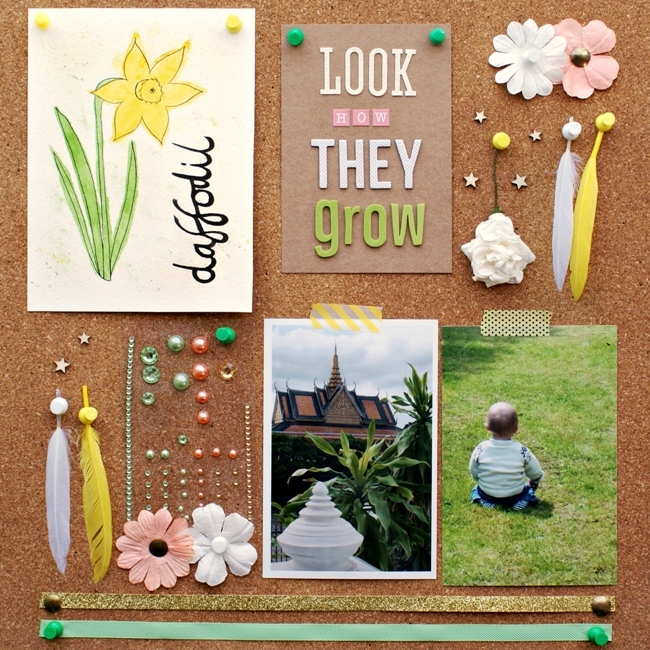 SJ Crafts April Challenge – A Mood Board For Ideas! Hello everyone! I don’t know what season you are experiencing wherever you are in the world, but here spring is in full swing, with flowers blooming and warmer days making me look forward to the summer! Or anything else you get from the mood board! 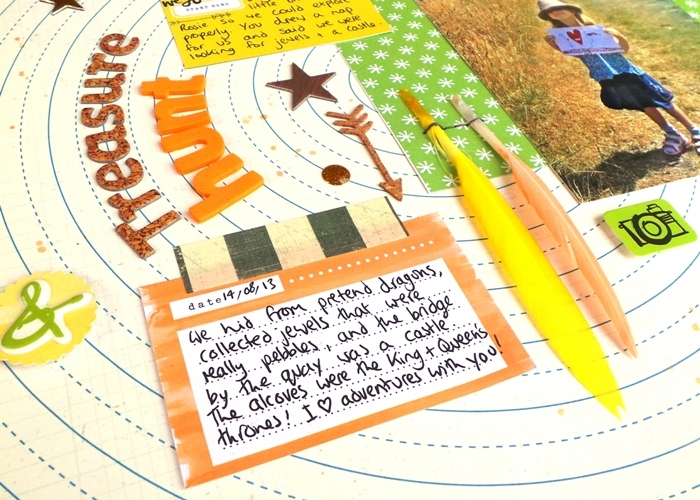 For my sample layout I mainly chose to use the colours of lime green and yellow, with some cork elements (including some American Crafts DIY Shop Cork Alphas and Arrows), but I swapped out the peach for a bolder orange because I wanted to use some Amy Tangerine Plus One items! I love this combination of colours, it makes me feel happy and lively just to look at them! 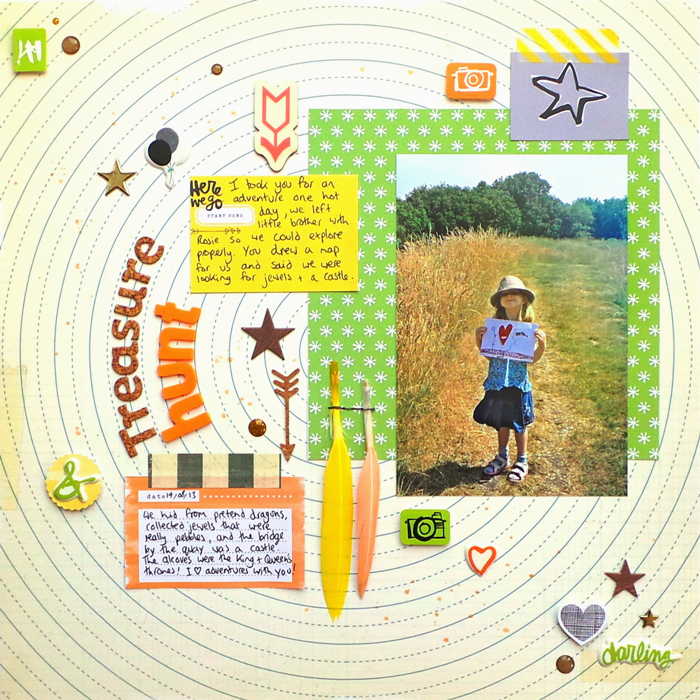 The background paper with the circles on is actually from Crate Paper’s Boys Rule collection, it’s called ‘Race Track’ – I bought two sheets of this paper because I loved the front and back! I sprinkled some drops of gold mist on this side to break up the circles a bit. ‘I took you for an adventure one hot day, we left little brother with Rosie so we could explore properly. You drew a map for us and said we were looking for jewels and a castle. Finally some Plus One Puffy Stickers and Accent Stickers, plus some Studio Calico Woodgrain and Gold Enamel Dots, are sprinkled around the page for my usual touch of scattering! What do you think about the way I used the mood board? What inspiration can you take from it? Check out the Challenge Post at SJ Crafts to see what ideas the other Design Team members found on the mood board and the samples they made! 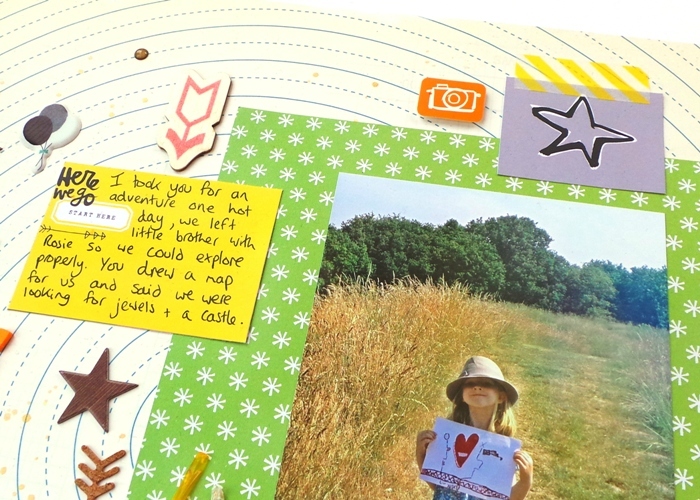 Plus you can enter your own project to have a chance to win a small spring prize!